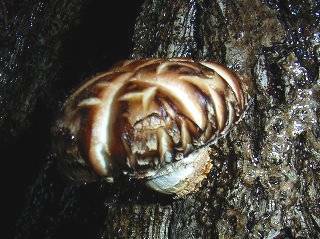 In shiitake, it enters an easy class in the cultivation of the mushroom, and if mushroom bacterium is suitably planted in the material wood, If it knows the point noted by cultivation, it is possible to grow it well. As for the material wood, it makes the use of the tree obtained easily cheap. The tree that the tree, tannin, and resin that the wood is hard are a lot of is not suitable for the mushroom cultivation. The cherry, [shii], [kashi], [mizunara], the quercus serrata, the walnut, the osier, and the miscellaneous trees of the tree with broad leaves such as the sawtooth oaks is used. The mushroom can be grown even by the pine tree though the pine tree is not suitable. As for the thickness, any one is possible though about 7-15 centimeters in the diameter are suitable. I used 25 centimeters in the diameter. I think that I often make it to the farmer's leisure season of winter though the deforestation time is made about November - February. It is not a translation that this also measures length and suitably though the material wood is cut in about one meter in length with a manual saw or the chainsaw. However, cutting measuring it finishes and externals finish beautifully. Trees of Futoshi eyes cannot be carried because it is heavy if it doesn't shorten it. October - May is usual the planting time. ..this range.. obtaining passing mushroom bacterium becomes difficult. It is "Mushroom bacterium" in the do-it-yourself store though planted in May and put by me There was hardly mushroom bacterium. Mushroom bacterium was not able to be obtained, and it made it from the nameko mushroom this year. The hole of 9 millimeters in the diameter and about 2-3 centimeters in depth is made for the material wood with the electric drill. It is a material wood of ten centimeters in the diameter and about 20-30 pieces are standards. I made it to about 15 pieces per one because of the number of material woods and the number of seed scenes. Securing the power supply of 100V becomes difficult because it often works in the mountain. I brought the gasoline engine dynamo of 600W in to the mountain and did. The seed scene is hammered in the hole and it crowds. It drives it to extent where the scene sinks from the surface a little. It puts it on the place where rain hangs in the shadow to which humid direct sunshine doesn't try the material wood after planting Mushroom bacterium. It piles it up as shown in the photograph. Afterwards, water is poured enough. Water was poured on the mushroom tree where the mushroom had grown incidentally because it was especially rainy little and the tree was dry in April this year. The turning down crowding is done to about entering the rainy season. It chooses in the shade of a tree and the woods where direct sunshine doesn't strike and it turns down. The mushroom tree is put on the tie for the mushroom. 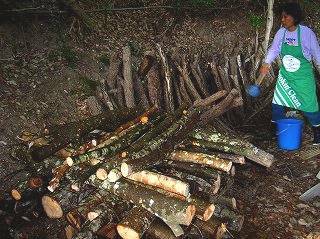 The tie is not used, and the material wood is grounded directly for the nameko mushroom. The tree might make about 1/3 buried in the soil. About one year - two years pass, and this is called "mushroom tree". The mushroom keeps being generated in the vicinity for several years - ten years. Mushroom tree that grows up the bacterium well, the mushroom will be generated next autumn. It manages as there is always moderate humidity. Moreover, if the state whose lowest temperature is 7-18℃ is continuously kept on around the tenth, the mushroom is generated. It is a mushroom that rain dries few this year though this photograph is a mushroom.